Noise Limiter - easy DIY installation or use as portable unit. Ideal for marquees. Approved by Environmental Health Departments. No professional installation required. Supplied complete with full instructions. Optional locking mains socket cover to prevent bypassing. The fast Fit Noise Limiter has been designed in response to demand for a low cost, easy to install solution to the growing problem of noise complaints. It has been approved by many environmental health departments. 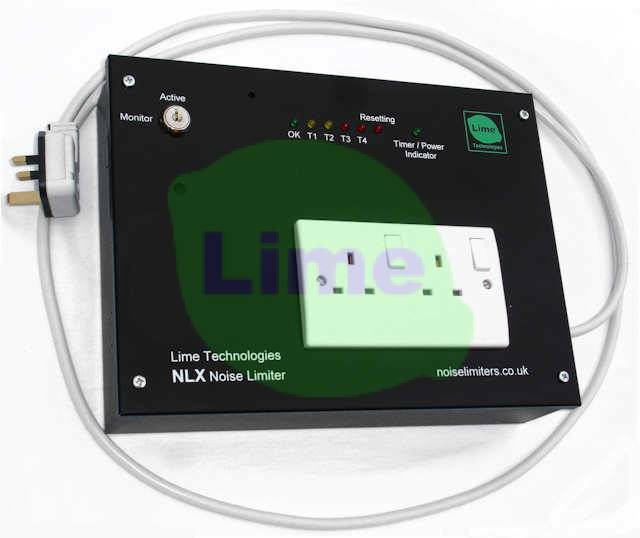 For unsupervised venues we recommend that the Noise Limiter is permanently installed so that it has control of all available mains socket outlets. Lime Technologies offer free telephone technical support to assist with installation and setup, although this is seldom required as the system is so easy to install - just plug in and play the music. • Optional high intensity warning beacon - recommended when noise limiter is not in performers direct line of sight. Note: A sound level meter will be required if you wish to set the trigger level to a specific sound pressure (dB) level - Click here for details.